We have made three sizes of picks: regular adult 5 hole, adult 3 hole and child 3 hole. Plates are cold rolled steel and the bales are heat treated chrome moly steel. Picks are black oxided. Fasteners are stainless steel or alloy. Shackles are stainless steel. 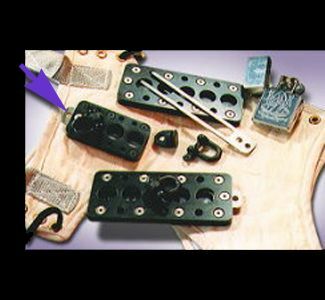 NOTE: As of June 2014, our stock is adult 3 hole picks, child 3 hole picks, and some replacement parts for our 5 hole picks. We will make a run of 5 hole picks in the future if our customers need them.